The above diagram shows a layout for electro-spinning or electro-spraying. More details about the pump to PC interface cables. Whilst I talk about electro-spinning in this post, my comments apply to electro-spraying too. 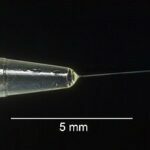 Electro-spinners use a very high voltage up to 50kV (at a low current) to attract a very fine threads from the needle of a syringe pump. The pump’s ability to provide very low flow rates combined with the high voltage allows the creation of new materials. Some of the applications are nano-fibres for protective clothing, ultra fine or specialist filters, medical drug applications, or to make materials for replacement body parts to name a few. It’s an exciting field indeed. If you want to see state of the art electro-spinning equipment that uses SyringePumpPro, take a look at Spraybase equipment. Make sure there is a mesh shield – larger than the pump – as large as the physical apparatus plus any reasonable airborne path back to the pump or other equipment. Shield all cables, with their shield outer core connected to earth. Distance is your friend – get the PC as far away from the high voltage as practical. Don’t allow long data cables to roam the bench top and travel any where near the pump or spinning apparatus. Take all extra length to the PC end of your setup. Make sure it is easy to shut off the High Voltage source in a safe and quick manner – don’t bury that power supply behind a bench full of other stuff. Have a safety switch system to shut off the high voltage should an operator attempt to open the shielded enclosure containing the pump. Cable positioning and insulation are vital points in your apparatus construction. I have seen several customers destroy laptops, and pumps following an high voltage leak. A poorly setup electro-spinning setup can leak high voltage into cables passing by – or from the syringe needle back through the pump. 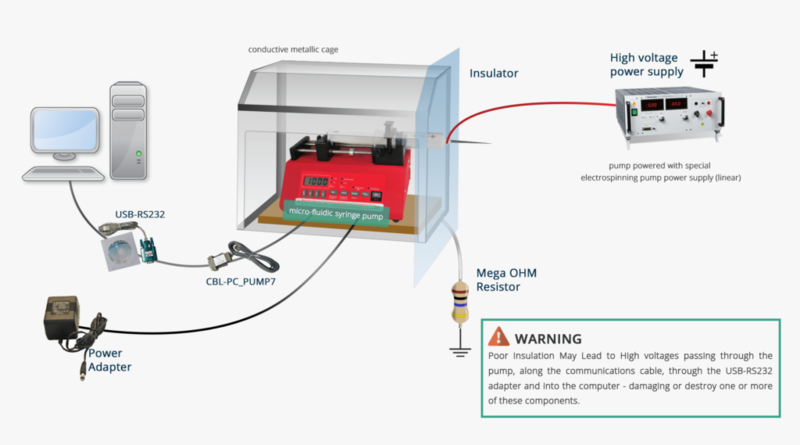 the high voltage travels along the data cable connected to the pump, heads into the USB-RS232 adapter, up the data cable and into the PC and then along the to the pc power supply if it’s a laptop. The high voltage may enter any cable that is not shielded. The pumps don’t seem to completely die instead they start doing weird stuff. They will work and then stop. They will communicate with SyringePumpPro and then stop. It can be hard to diagnose. Laptops and PC do seem to die outright – they don’t take this kind of treatment lightly. We have been electro-spinning for a few sessions now – after just getting going – they are past the initial get it going phase. Our pump started miss-behaving a few sessions ago, and then it seemed all right for a couple of sessions and now it wont work at all – your software isn’t communicating with our pump. We have tried re-installing your software but it didn’t help – re installation hasn’t ever fixed my software! I cant prove this – but I think we are seeing leaky high voltage escaping into the pump every now and then. I also suspect that as the operators get more comfortable, stuff moves around on the bench and perhaps a cable strays into the danger zone. The pump chips do have limited electrostatic voltage protection – this is not a feature of the pump but a feature of all modern integrated circuits. So rather than the traditional zap – it’s dead, I think we are seeing a series of small zaps which wind up killing the chips protection circuits – then one more small? zap is all it takes. Only once was I approached and a customer told me – I killed my laptop. What I am trying to say here – is I think operators get an early subtle warning that the high voltage is escaping, and rather than one zap killing something, we have gear exposed to marginal conditions and being damaged. Look for signs of problems and audit your electro-spinning setup regularly. I am concerned about the high voltage safety side of things – I was given a shock whilst working on an aircraft radar transmitter. It was 30kV – not easily forgotten, I was quite lucky and didn’t suffer at all – but years later I still approach the high voltage stuff carefully – it JUMPS!